Ned Lamont walks to the Capitol in a parade after being sworn in as Connecticut's 89th governor. 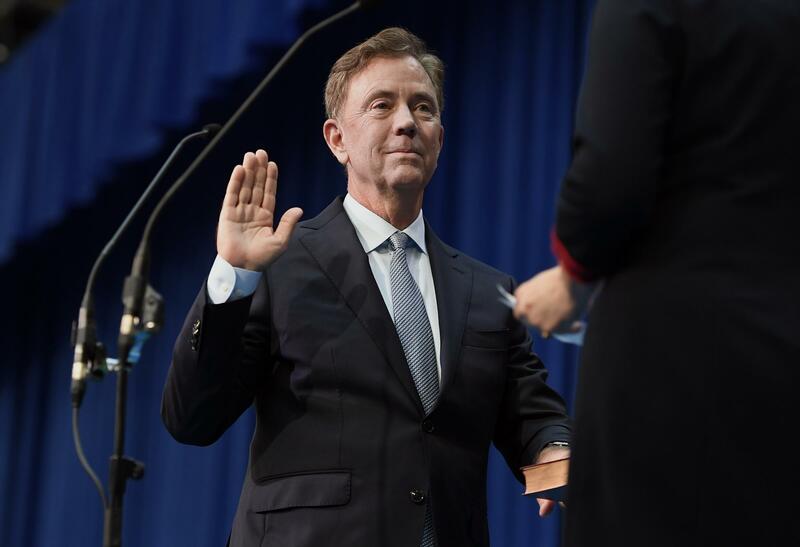 Ned Lamont takes the oath from former state Chief Justice Chase T. Rogers while his wife Annie holds the Bible. He took the oath from his friend, former Chief Justice Chase T. Rogers of the Connecticut Supreme Court, reaching the pinnacle of state politics after losing statewide races for U.S. Senate in 2006 and governor in 2010. At his side was Annie Huntress Lamont, his wife of 35 years and a successful venture capitalist. Watching from the front of vast drill shed of the William A. O’Neill Armory were three of his four living predecessors: Democrat Dannel P. Malloy, Republican M. Jodi Rell and Lowell P. Weicker Jr., an independent who gamely made his way on a walker. Missing was the twice-convicted Republican John G. Rowland. Ned Lamont is the first Connecticut Democrat in more than a century to succeed another Democratic governor in an open race, an unexpected first given that Malloy, left office as one of the most unpopular governors in the U.S.
Lamont struck a light tone in his brief inaugural remarks, knowing he would deliver a more substantive State of the State to a joint session of the General Assembly by day’s end. The Rev. Ralph Ahlberg, his former pastor at Round Hill Community Church in Greenwich and a one-time tennis partner, told the audience of 1,200 that Lamont was a man of integrity, a tennis player fairly called the lines — perhaps not the best metaphor for a Democratic audience.